JNN 04 May 2014 : Sri Lankan legislators have called on President Mahinda Rajapaksa to protect the country’s Muslim minority against Buddhist extremists. 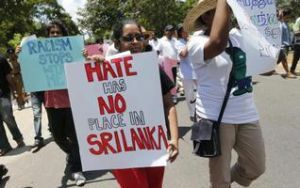 The Muslim Council of Sri Lanka said Friday that 16 out of the 18 Muslim parliamentarians have asked the president to take action to stop hate crimes committed against Sri Lankan Muslims. “Muslim parliamentarians wish to bring to Your Excellency’s kind attention the continued hate campaign, intimidation and threats to Muslims, carried out by some Buddhist extremist elements,” the MPs said in a joint letter. There are rising concerns over the recent attacks by Buddhist extremists targeting mosques and churches across the island nation. In January, mobs led by Buddhist extremists attacked Christian prayer centers and mosques in southern Sri Lanka. Sri Lankan police are accused of not taking appropriate action in this regard. Muslims remain the second-largest religious group in the country, making up nearly 10 percent of the Asian country’s population. Sri Lanka is emerging from nearly four decades of ethnic war, which according to the UN has claimed at least 100,000 lives between 1972 and 2009. President Mahinda Rajapaksa maintains that peace, stability and the chance of greater prosperity have prevailed across Sri Lanka following the end of the civil war. This entry was posted in Jafria and tagged Muslim Council of Sri Lanka, Muslim Minority, president mahinda rajapaksa, Sri Lanka, Sri Lankan, Sri Lankan Muslims. Bookmark the permalink.